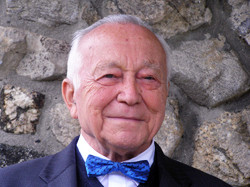 During the 2007 school year eighth-grade students from Columbia Explorers Academy (Chicago, Illinois) asked Rudolf Graichen two questions regarding his personal experiences. Question #1 : How did you feel when you went to prison both times ? Question #2 : How did you survive the Holocaust ? The teacher said, "You should all wear your Hitler Youth uniforms so that everyone will see that you are nice Hitler boys." I would rather have died than put on a Nazi uniform. Rudolf was born in 1925 in Germany. In 1937 the Gestapo arrested all the male members of the local congregation. His father was sentenced to five years in prison. As a 12-year-old in school, Rudolf withstood intense pressure to join the Hitler Youth. 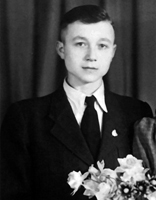 In 1938, along with his sister, Rudolf was taken from school by the police to a reform school. Later they were sent to live with a Nazi family. In 1943, he was sentenced to four years in prison, more than a year of which was spent in solitary confinement in Stollberg. His mother died in Ravensbrück concentration camp shortly before liberation. He was released at the end of the war. In 1950, he was tortured by East German police and sentenced to four years in prison. Graichen now resides in Brady, Texas.